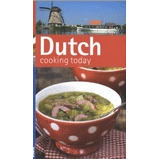 Over the Holiday season I found a really nice book: Dutch cooking today. Expats living in the Netherlands, who want to learn how to cook some traditional Dutch recipes while they live here and want to find things to do with the limited range of food available in supermarkets. Someone considering moving to the Netherlands who wants to know what "traditional Dutch food" really is.